Loch is a rural town on the South Gippsland Highway, 90 km south-east of Melbourne and 15 km before Korumburra. It is situated in foothills of the Strzelecki Ranges with deep soil and plentiful rainfall. Land selections began in the early 1880s. When plans were afoot for the Great Southern Railway, from Dandenong to South Gippsland, a town was surveyed and named after the Governor of Victoria (1884-89), Sir Henry Loch. 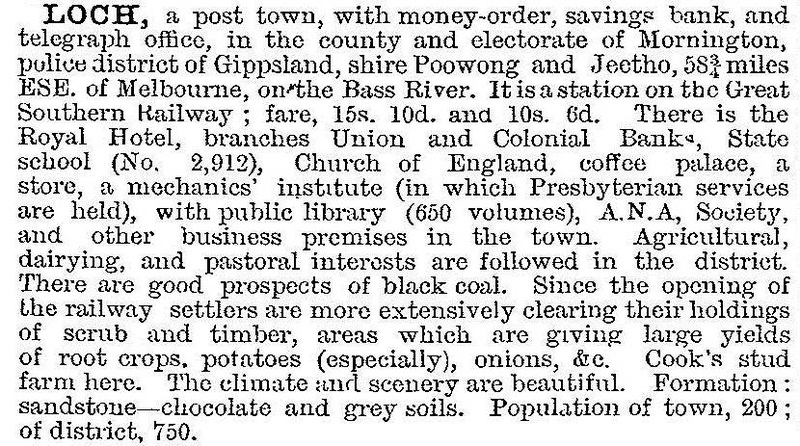 Town allotments went on sale in 1887, three years before the railway was extended from Tooradin to Loch. Anticipation of the arrival of the railway brought settlers: the first store and an Anglican church opened in 1888, and the next year a local newspaper started and a school and a hotel opened. Loch’s position on the railway line was a significant contribution to its prosperity. A livestock trucking yards was built near the station in 1911, in addition to its saleyard (1891). When the butter factory closed in about 1914 it was only a short journey for cream to be railed to the butter factory at Bena. The most prominent memorial to Loch’s prosperity was the two-storey Union Bank (1902). Between World Wars I and II a memorial reserve (1924) was laid out and the Masonic lodge built its own hall (1924). Electricity was switched on in the town in 1930 and an infant welfare centre started in 1939. Rather late in the piece, a bowls club was formed in 1972. Loch has had the advantage of being compactly laid out and being able to keep most of its buildings in use. The railway closed in the 1990s and was taken over as a tourist rail route from Nyora to Leongatha. Loch rebranded itself as Loch village, with an array of collectables outlets and hospitality venues. The Anglican, Catholic and Uniting churches continue, along with the Masonic hall, the primary school (70 pupils, 2014), bowls club and public hall.